airdump-ng is used to list all the network around us and display useful information about them. It is a packet sniffer, so it is basically designed to capture all the packets around us while we are in Monitor mode. We can run it against all of the networks around us and collect useful information like the mac address, channel name, encryption type, number of clients connected to the network and then start targeting to the target network. We can also run it against certain AP(access point) so that we only capture packets from a certain Wi-Fi network. First, let's look at how to run the program. In this case, we need our Wi-Fi card in Monitor mode. The name of the our Wi-Fi card is wlan0. Note: We can press Ctrl + C to stop the following execution. In the above image, you can show all the wireless networks like Oppo, perfe, Fligh, Ashu, LIFCA, Xiaom, BS1A-YW5 etc and the detailed information about all the network. 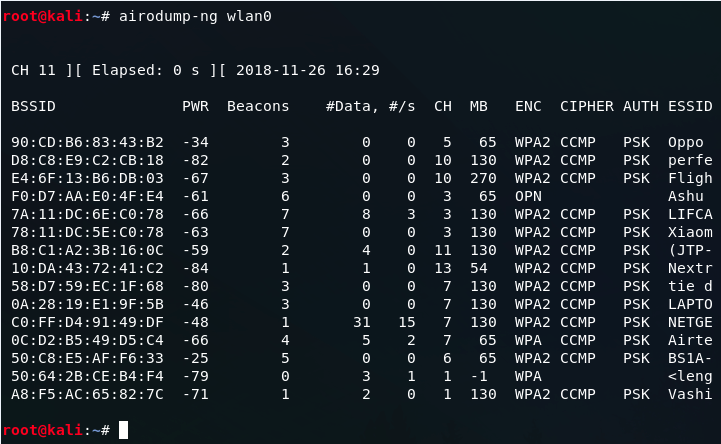 Note: airodump-ng is also used to identify all of the devices connected to the networks around us.